Saturday night we went back to the boardwalk and made a bee-line for the cars that Gavin and Brian rode together the night before. It just warmed my heart so much to see them on it together - I had to see it again. We could not have predicted the heartwarming events that were to follow. 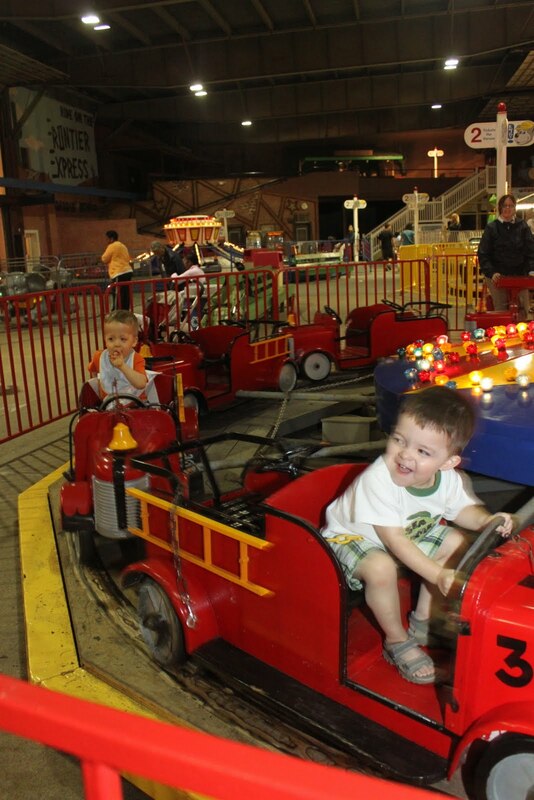 Gavin and Brian acted like such brothers on this ride. Gavin wanted to touch Brian and put his arm around his shoulder...which prompted Brian to push his brother's hands off of him. The first time they went around and the ride ended, Brian looked for us and signed "MORE! "...so around they went for a second turn. This time, when the ride ended, Brian just couldn't contain his love for Gavin any longer. What happened next left me speechless - and had Ed and I overcome with love for these two boys. This is the sweetest video we will likely ever take. Next stop was a ride with Daddy on the helicopters. As you can see by Gavin's smile, he LOVES doing things with his Daddy. Ed was a champ for squeezing into the back of that teeny little chopper to make the boys happy! In between rides, we stopped for a treat and let Brian have his first...and very own...ice cream cone! (Gavin isn't a fan of the cold ice cream) We sat on a bench and I was amazed that he ate the whole cone without getting a drop on his shirt. Well, until the very end when he was trying to shake the last bits of ice cream out of the bottom of his cone. He created quite a spectacle - everyone around us seemed as excited as we were for him. (Although, curiously, I was the only one with a camera, flash and video the size of Texas trained on him.) He definitely knows how to draw a crowd!! Continuing our night of "new experiences" - we went back to the train ride. All week I had been staring at that ride - wondering if there was a way I could get Gavin on there safely. All week it seemed too scary. The seat backs were low and there wasn't something I could really strap him around. But for some reason...that night...I decided to go for it. It was late and no one was on the ride. I spoke to the attendant who agreed if anything were to go wrong or if Gavin was upset she would stop the ride. I went out and played around with the rug gripper and the strap and then we sat Gavin down. A couple other children hopped on trains after that and away they went. Gavin...on his first solo ride. Seeing my boys - one behind the other - riding alone and looking so confident - it took my breath away. It's a feeling that's hard for me to describe. But seeing Gavin sitting on the ride by himself...it was just too much. In moments like this, his whole life journey and all the negativity flashes before my eyes - and it makes me feel SO proud of how far he's come. This trip did wonders for Gavin's confidence. And you know what, it did wonders for MY confidence, too. I have done a lot of worrying as a Mommy - worrying about the boys getting hurt, getting sick, getting germs, getting - well, you get the idea. This week as I watched them enjoying themselves, I payed attention to my reactions. I wasn't stressed. I wasn't jumping to their rescue. Brian fell and skinned both knees - and I brushed him off and we went on another ride. Gavin, whose hands are constantly in his mouth would put his hands on rides and I didn't freak. We went to restaurants and Brian sat in the booth and sometimes crawled under the table. Okay, that part did gross me out...but the rest, I think, entitles me to some kind of award like, "most improved germaphobe worrywart Mommy", don't you think?? But the big moment was when Gavin was on that fire truck. I wondered why it took me all week to get up the nerve to put him on there. I wondered why I was so worried that he wouldn't be able to do it. He was perfectly fine...and so was I. This morning as we unpacked and struggled to keep our eyes open, Ed came to me with a piece of mail. It was a letter from the Attorney General. Way back when, when I was asking our insurance for a nurse for Gavin - they denied us. We were able to get it through Gavin's secondary insurance and never gave the denial another thought. Until today. Apparently, our name was included in a class action suit against Blue Cross Blue Shield for their denial of something appropriate for a patient. We, along with many others, were given a share of the settlement. Enclosed with the letter was a check for over three THOUSAND dollars!! I stood there with my jaw on the floor as Ed proclaimed the money, "Pennies from Heaven". What a way to end a glorious week. Kate, your boys are beautiful! Tears flowed on the brotherly love here, too. So happy you had such a great vacation!! Wow..God is good! What a great vacation for the sweet Leong family and an even better surprise in the mail! Use the pennies from Heaven to indulge in something wonderful for (hopefully) the newest "addition" to arrive within the next nine months!